Also referred to as degenerative joint disease, arthritis affects the smooth cartilage of joints in the body. The cartilage becomes irregular and raw, and rubs together, causing pain and lack of joint mobility. The irritation of the joint lining causes chemical mediators to inflame surrounding tissue, which then causes more pain and inflammation. Since cats’ wild heritage teaches them to hide pain, the signs can be very subtle. You may notice your cat sleeping more, playing less, and jumping up on favorite spots less frequently. In more severe cases, lameness may be seen. The signs can come and go, just as in people who have “good days” and “bad days” with arthritis. A veterinarian can often diagnose arthritis with a physical examination and x-rays. X-rays can also indicate the extent of joint damage. What can be done for a cat with arthritis? If the cat is overweight, losing weight decreases stress placed on the joints. 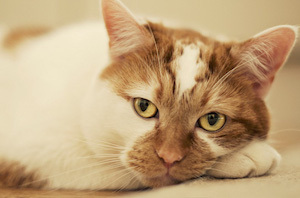 Welactin, a fish oil supplement for cats, is a natural anti-inflammatory agent. Dasuquin is a supplement that helps repair the cartilage at the end of joints and increases joint fluid to lubricate the joint. Home adjustments for comfort, such as using low lipped litter boxes for easier entry, putting the litterbox on the main floor to avoid stairs, and small pet stairs for climbing onto the bed. If your cat is slowing down, sleeping more, jumping or playing less, or has any signs of joint discomfort, please call our office for an appointment.